If your child has forgotten their password their class teacher will be able to issue them with a new one. 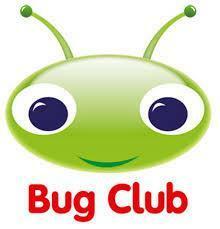 Bug Club online provides your child with additional reading books that are accessible online, your child's class teacher will provide them with a variety of texts and genres that are available as e-books. They are chosen at the appropriate level for your child. Should you have any questions or queries please do not hesitate to contact either myself or your child's class teacher. Thank you once again for your continuous support and cooperation. Children are immersed in various language experiences and activities to allow them to build on skills, knowledge and understanding to progress and develop their Speaking and Listening, Reading and Writing throughout the school. To promote pupils enjoyment of books the school library is open to children every day between 12.15pm – 12.45pm it is also open every Monday between 3.15pm – 4.15pm to allow you to come to the library to work with your child or change library books. Please see below a list of 'sentence starters' which have been translated from welsh to English, that will help you support your child when using the 'Welsh dragon' books. These books will come home every week with your child. Please see the attached documents labeled according to year groups. Depending on what year your child is in will depend on which document you will need to access. there are two documents per year group to look at.